Meanings of Paintings - WILLIAM MONAGUE NATIVE ART Inspired by Mother Earth and the Spirit World, William Monague shares his unique artistic expression and Anishnabek Culture by providing the "Spirit of Color" to any home or business. Eagle in the Sky - "Strength & Protection"
Blue Moon - "Remembering A Loved One"
Elders passing on knowledge to the young ones. Our future generation. SUNSET HONEYMOON The power of togetherness and marriage. BLUE MOON Remembering a loved one who has left this world. Inspired by love, together again. SKY WOMAN In the creation story, her father was the ruler of the Sky World. She was the first woman who gave birth to the first man. TURTLE ISLAND "Turtle Island" is the english translation of the name given by the Anishinabe to the american continent we stand on. WALKING IN BALANCE WITH MOTHER EARTH The four seasons, four colors of man and four directions of earth. TURTLE SPIRIT Respecting the knowledge and vision of our educators. MYSTICAL VILLAGE "Mystical Village" was nominated for a Canada Arts Council award in 1994. A unique method of crystallizing acrylic paints to create a northern lights effect. ELDER PINES Signifying strength, knowledge and wisdom of our Elders. painted turtles embody the symbol of healing and the reconstruction of Mother Earth. The Eagle represents the Ojibwe belief of the messenger answering our prayers; giving us the gift of strength and protection. AWASIS His youngest daughter Wapikehewasis meaning "White Eagle Child". TEACHINGS Elders passing on knowledge to the young ones, our future generation. STRENGTH, HOPE & NEW BEGINNINGS Finding the strength and courage to begin a new way of life. MIGRATION (LIFE ON BEAUSOLEIL) Leaving Coldwater and their agricultural way of life. The Ojibwe were forced to live on Beausoleil Island for a short time. It was said the northern lights were the glow of torches used to illuminate the path of soul spirits on their way to the land of peace. EAGLES IN THE SKY Strength and Protection. RAINBOW The creator placed a rainbow in the sky after the great flood. The rainbow in many cultures is a sign of inclusiveness, hope, pride and diversity. 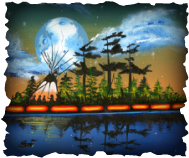 THE STORY OF FAIRY LAKE The story of "Lady of the Blueberry Moon" On Beausoleil Island and the great protector "Nanaboozhoo" who heard her cries for help. A long furious battle was fought with a dreadful beast from another world and all were mortally wounded. The spirit of the woman forms the outline of Beausoleil Island. Nanaboozhoo’s body lay to rest on a small island near Giant’s Tomb. Rock stained blood on Fairy Lake forms the eye of the beast. Today, the spirit of this beautiful young woman can sometimes be heard singing or seen as she walks about her beloved island. Sharing Anishnabek Culture and Spirituality through the "Spirit of Color".